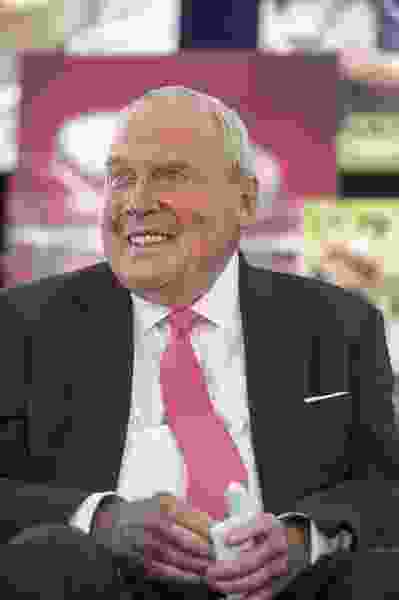 Leah Hogsten | The Salt Lake Tribune Huntsman Cancer Institute (HCI) founder and cancer survivor Jon M. Huntsman Sr. and Karen Huntsman thank over 750 people in attendance the ceremony, which falls on his 80th birthday. Huntsman Cancer Institute (HCI) dedicated the Primary ChildrenÕs and FamiliesÕ Cancer Research Center, a world-class facility dedicated to advancing cancer research and patient care, June 21, 2017. Washington • Jon Huntsman Sr. has joined a growing chorus of prominent Utahns in encouraging Mitt Romney to run for the Senate in 2018 now that Sen. Orrin Hatch is retiring at the end of his term. Huntsman, who had backed several of Romney’s previous political campaigns but who funded his son Jon Huntsman Jr.’s 2012 bid for president over Romney, says he believes the former Massachusetts governor and now-Utah resident would be a great fit in the Senate at a critical time. President Donald Trump called Romney last week to encourage a bid, a source close to the White House has confirmed. Hatch had said previously he’d like Romney to run. And Lt. Gov. Spencer Cox, a possible Senate candidate himself, said he’d back Romney. “I would vote for Mitt if I ran against Mitt,” Cox joked on Twitter. Huntsman Sr. had supported Romney’s unsuccessful challenge against Democratic Sen. Ted Kennedy in 1994, Romney’s successful run for Massachusetts governor and his 2008 presidential bid. But the relationship between the two families soured as Jon Huntsman Jr. endorsed Sen. John McCain in 2008 and then ran for president against Romney in 2012. Huntsman Sr. spent nearly $2 million in the 2012 campaign. Huntsman Sr. later supported Romney after his son withdrew from the race. Last week, Huntsman Sr. said that, “second to my own son,” Romney has earned his great respect and that despite a public rebuke of Trump during the GOP primaries, Romney would be able to find common ground with the president. Huntsman Jr. considered a Senate run before Trump nominated him to serve as the ambassador to Russia. On Monday, a Romney aide noted that the former governor had been diagnosed with prostate cancer and had undergone a successful surgery last year; Huntsman Sr., who talked to The Tribune before Romney’s diagnosis went public, faced the same cancer scare 26 years ago. Former Rep. Jason Chaffetz is a Utah Republican who also hopes Romney pursues a Senate seat. Chaffetz caught his political break working for Huntsman Jr., then backed Romney in their 2012 showdown. Chaffetz said that Romney and Huntsman Jr. have been on opposite sides competitively but that enough time has passed since the 2012 race. Editor’s note • The Salt Lake Tribune’s owner and publisher is Paul Huntsman, a son of Jon Huntsman Sr. and a brother to Jon Huntsman Jr.